After two successful editions in Berlin (2013) and Helsinki (2014), the DHC+ Summer School went south. 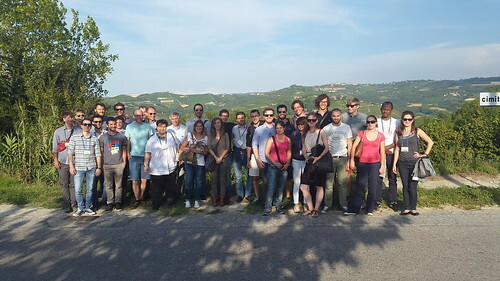 The 3rd edition took place from 30 August to 5 September in Italy and was kindly hosted and co-organised by Politecnico di Torino and ISMB – Istituto Superiore Mario Boella. The DHC+ Summer School is designed to provide a clear introduction to the district heating and cooling technology, heat production processes, integration of renewable energy sources, operational issues of district energy networks and basic consumer applications. For the first time, the programme featured the interaction between district heating and cooling and ICT technologies, Horizon 2020 funding rules, as well as design and modelling of heat networks. Participants have very much appreciated the involvement of the local energy companies – IREN and EGEA – who not only opened their doors for the technical visits to their CHP plants, but also provided lectures and practical demonstration of ICT tools. prepare a sound Horizon 2020 project proposal on waste heat recovery from urban facilities and re-use in district heating and cooling systems. The Summer School in Italy wouldn’t have been so pleasant if it hadn’t included a welcome guided tour in Torino, wine tasting in Langhe Area and farewell pizza party. DHC+ would like to thank the Italian hosts and supporters for the excellent organisation. The Platform and its Education & Training Working Group would also like to invite organisations interested in hosting future editions of the DHC+ Summer School to contact us at dhcplus@euroheat.org .